Maple Park Fun Fest is a classic small town festival geared for big time entertainment. Occurring over Labor Day Weekend, Fun Fest has provided the perfect way to celebrate summer’s end for over 10 years. Visitors enjoy live entertainment, a huge arts and crafts show, car show, and of course FIREWORKS – those are just a few of the highlights! Both children and adults will find plenty to do all weekend long. Fun Fest will provide a glimpse into our charming community. 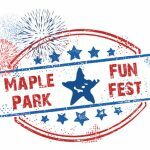 Come on out and experience the magic of Maple Park Fun Fest.